While on an outing with my bird club a few weeks ago, I watched a Downy Woodpecker on a small tree trunk vigorously pecking away at the bark. He kept creeping lower and lower. Since this is a common bird that can be seen year-round across the US and Canada, I don’t usually get too excited to see one. But this bird was almost oblivious to my presence. The bugs in the tree must have been delicious because he didn’t care that I was creeping closer and closer until I was able to get this shot. Downy Woodpeckers don’t mind people and will readily come to backyard feeders. The bird in my photo is a male. Males and females look alike except for a red patch on the back of the head of the male. Before I lost my mature elm trees several years ago to Dutch Elm disease, I had several families of woodpeckers in those trees everyday. They mainly eat insects and loved the beetle larvae in the bark of the sick trees. They still visit my peanut and suet feeders, but I don’t see them as often anymore. This post is linked to Saturday Snapshot, hosted by Melinda of West Metro Mommy. How beautiful! We get an occasional woodpecker in our yard but they look different from this one and they seem larger. Thanks for sharing this. Have a great weekend! It’s awesome that you got so close and could get such a great photo. We dont have any trees in our yard but hear them in the forest nearby. Fabulous shot Leslie. How lovely to have such a beautiful bird to see commonly, I always stop to appreciate our parrots and try not to take them for granted- people travel around the world to see them. I think he was posing for you! 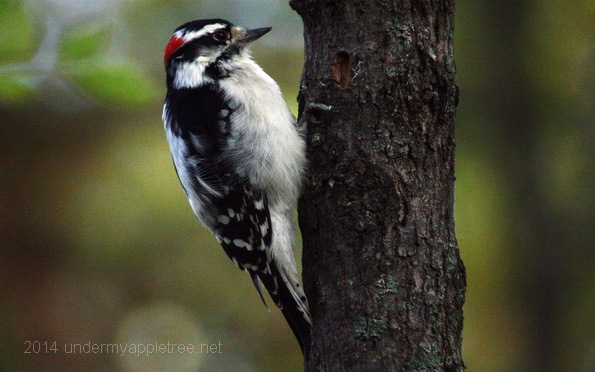 When I was a little girl Downy Woodpeckers were my favorite bird. That’s a sharp photo you’ve here. I’ve also seen a few Downy Woodpeckers this week, and some more. Beautiful photo! We’ve had pileated woodpeckers in the forested area behind our backyard, but they’re rare. They’re big and not as friendly as this little guy. When I’ve tried to take their photo, they fly away. Wow. He let you get very close! Good job! Chickadees and downy woodpeckers are the staple of my winter bird watching. I never tire of the , and admire their hardiness. I do like a woodpecker, although we don’t get them very often where I live. I think it is just too urban. Very occasionally I see a green one. Great shot, it’s a beautiful bird! We have woodpeckers in our yard all the time. They peck on the side of the house and on the phone pole by the road.